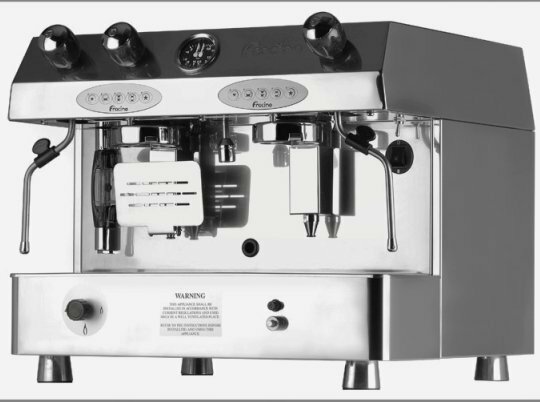 The Fracino 2 Group Contempo coffee machine is also available as a dual fuel option. The same great specifications as the standard Fracino Contempo 2 Group machines but with the option to use LPG or electricity they provide unrivalled flexibility and mobility whilst still retaining high volume output. These machines are ideal for mobile catering units and remote area locations. Key Dual Fuel Features: * Highest powered LPG system in the world provides unrivalled output of coffee, hot water and steam. * LPG fuelled burner equivalent to 3.6kW electrical power rating. * Fitted with electronic ignition and flame failure device. * Boiler pressure is controlled by a gas pressure valve set at 1.0 bar with low flame adjustment which controls the gas burner. * Note a 37(LPG)/30(Butane) mbar gas pressure regulator must be fitted prior to installation of the machine. * High groups to allow for large take-away and latté cups with 130mm clearance. * Flip down espresso tray fitted to one group. * Sight control of pilot flame through front of coffee machine. * 350 watts (electric) supplied by 240v generator or 12v inverter.